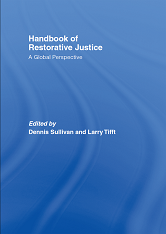 Handbook of Restorative Justice: A global Perspective is a collection of original, cutting-edge essays that offer an insightful and critical assessment of the theory, principles, and practices of restorative justice around the globle. Its diverse essays not only explore the various methods of responding nonviolently to harms-done by persons, groups, global corporations, and nation-states, but also examine the dimensions of restorative justice in relation to criminology, victimology, traumatology, and feminist studies. In addition they contain prescriptions for how communities might re-structure their family, school, and workplace life according to restorative values.